soft pouch w/ belt loop? Discussion in 'Accessories' started by vinay, Mar 23, 2012. Is there some kind of soft pouch that i can put on my belt? Soft enough that it doesn't hold a structure if nothing is in it.. something like this with a belt loop would be cool.. The ones I use have a belt loop and can fit on a belt albeit a little uncomfortably, but I carry it with a shoulder strap instead. that would hold the gear but looks like it would retain its boxy shape all the time.. it also has an extra pocket.. Here are some interesting ones that came off the web.. not neoprene, but they look like they'll atleast collapse went empty..
Lowepro Terraclime 30 | Flickr - Photo Sharing! My E-PL2 with an Industar-69 pancake lens (but without the VF-2) just fits into a medium DigiStow but the pouch can't be zipped closed, so it's more like a holster. What size camera are you trying to fit? I use the Black Widow Spider Holster. Works great for camera+pancake. 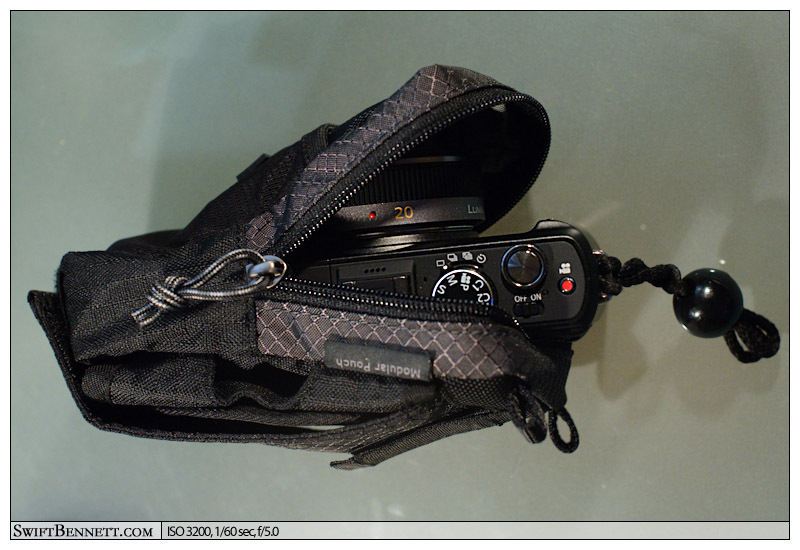 I have the Thinktank modular pouch and my E-P1 with the Panny 20mm fits perfectly - I actually had not tried it until you posted the link. It works on a belt or on the strap of a backpack, etc. It's a really nice little pouch and it folds pretty flat. P1020885 | Flickr - Photo Sharing! I had a look at all 3 of those: I got the Terraclime 30 and it was too small for my E-PL1 (even with just the 14mm pancake on it) so I use it for other stuff like legacy lenses. It's a great little pouch for the price though (£2 on ebay/amazon). I ordered the next size up (Terraclime 50 which is huge) for my E-PL1 but the Terraclime 30 fits a GF3 with 14mm or 20mm pancake lens on. The rip off holster things looked good, but I could not find them in the UK and the thinktank pouch was discontinued/out of stock wherever I tried. The Optec Neoprene Soft Pouch (in the link in your first post) is what I wanted but again could not find them in the UK. What size camera are you trying to fit? Might be just a tiny bit too chunky for a Terraclime 30 then but not sure? The Terraclime 50 will fit easily but it's probably about twice as big as what you need (I can get a Nex 5 and kit lens in it easily). I was hoping there would be something made of a stretchy neoprene.. giving me some flexibility yet maximizing compactness.. finding the right bags and pouches is so hard! I went to the stores to try out some of those belt pouches.. even found the case logic one Ned suggested... nonetheless, the one thing I can conclude is that a chunky camera in a belt pouch just doesn't look right on a skinny guy!! Changing direction on this, I tried something a little different - I took an old lightly padded camera pouch w/ drawstring and looped the drawstring through my belt loop.. although the camera swings a little, it didn't result in a big bump.. I suspect similar results could be achieved with a small neoprene lens pouch ..
Do you use the holster when you're actively taking pictures or all the time? do you ever cover the camera while on the holster? Hi Ned...where did you buy your case logic case? That looks very interesting Ned.. not sure from the dimensions if it has the required depth though?